“Elvis slept here”—that’s what a small, out-of-the-way motel in small, out-of-the-way Kalama, Washington, could claim after September 4, 1962. It happened this way. Sometime during the morning of Monday, September 3, 1962, a black Chrysler station wagon and a large recreational vehicle headed north out of Los Angeles on Interstate 5. The two-vehicle convoy carried Elvis Presley and nine members of his Memphis Mafia. 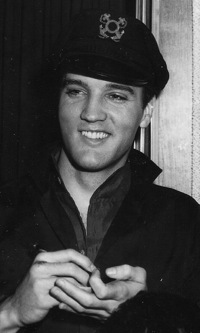 Their destination was Seattle, Washington, where location filming on Presley’s new movie, “It Happened at the World's Fair,” was scheduled to begin on September 6. After driving all day Sunday and through that night, Elvis’s caravan passed through Portland, Oregon, in the early hours of Monday, September 4. Crossing the Columbia River into Washington State, the two vehicles continued north on Highway 99. About 35 miles north of Portland, they pulled off the highway and into the parking lot of the new Columbia Inn Motel in the small community of Kalama, Washington. It’s possible the Presley entourage had a reservation at the out-of-the-way motel, but more likely they simply saw it from the highway and decided to stop for some rest. Elvis took a double suite, rooms 219 and 220, while the guys with him occupied nine other suites. While Elvis retired to sleep through the day, word began to filter out about his presence in the sleepy little community of Kalama. First a trickle, and then a stream of teenagers from Washington communities up and down the highway began arriving in the Columbia Inn parking lot. 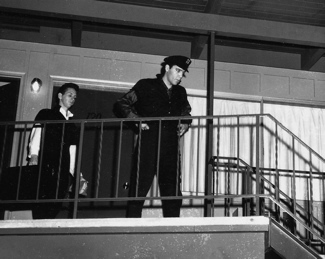 Hundreds of teenagers, and some adults, waited patiently for Elvis to emerge from the Inn. 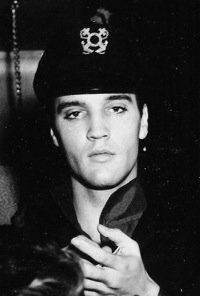 After sleeping for 12 hours, Elvis called the Inn’s restaurant at 6 p.m. to order his “regular” breakfast. It included three eggs, the yoke broken and fried hard; 10 slices of bacon, fried to a crisp; a side order of hash browns; one bowl of dry cereal; one bowl of peaches; and five cups of coffee with cream. Presley’s nine companions ordered items off the dinner menu. The food bill itself was the largest the motel’s restaurant had ever recorded for any individual or organization. The phone bill was huge, as well, with calls going out to cities around the country, including Hollywood and Memphis. Throw in the charges for the 10 suites, and Tuesday, September 4, 1962, was a day to remember for the Columbia Inn Motel. It is September again, this time in 1984. Robert Doggett, an English teacher at Lakeside High School in Portland, had spent a few days fly-fishing on the Kalama River. After camping out for a couple of nights, he felt “grungy” and decided to drive into Kalama and find a place where he could rest and clean up. The only motel facing the frontage road was the Columbia Inn. “It’s a nondescript two-story structure, all steel and concrete, an unbroken expanse of 50 identical rooms facing straight out onto the interstate,” Doggett recalled in his article for Seattle Weekly. “So, what’s all this about?” he asks the white-haired lady. Looking closely at another photo on the wall, Doggett asks, “Who are those fellows?" Once in room 220, Doggett had trouble imagining that Elvis had been there. Even with the door closed and the heavy curtains drawn, the trucks on I-5 could be heard roaring by. They probably didn’t bother Elvis, though, since that stretch of freeway had not been completed in 1962. Doggett takes a shower and jumps into bed for a short nap. As he pulls out of the parking lot, Doggett drives past the Columbia Inn Restaurant. He sees a small sign next to the door that reads, “Famous People Who Have Eaten Here.” There are just two names carved on the sign—Elvis Presley and Jack Benny. It’s summer now, and after a few days in Seattle, I’m heading south on I-5 to visit some relatives in Portland. 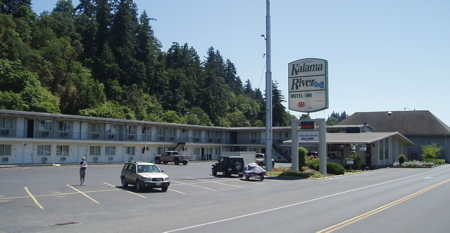 I knew I’d be passing the Kalama River Inn along the way, so I’ve planned a stop there like Elvis did 45 years before. I’m determined not only going to see the Elvis photos on display at the inn, but also to get copies of them. So when I left Spokane I had my laptop computer and a scanner packed in the back of my car. In the motel office, I spot the photos in question. There are five; Elvis is prominent in four of them. They were all 5” X 7” horizontal color prints in inexpensive wood frames. They’re hanging in a vertical row by the side of a doorway behind the front desk. I’m amazed at how clear and sharp the photos were, considering they were probably taken with a cheap instamatic camera almost 46 years ago. There’s one of those “press for service” bells on the counter, so I give it a thump. That brings out the owner, Charan Sandhu. I introduce myself and explain I had written a book about Elvis and am now trying to find out as much as I can about Elvis’s 1962 stay at his motel. Mr. Sandhu, who along with his wife had purchased the motel in 2002, can tell me little I didn’t already know. He confirms that occasionally Elvis fans drop by to see the photos. A couple recently came from California. Then I took a deep breath and asked the big question. “Would you mind if I used my computer to make copies of your photos?” Mr. Sandhu looks at me for a few seconds. I’m sure he’s going to say no. Instead, he asks, “Would you have to take them?” When I assure him the photos will never leave the lobby,” he agrees. I quickly set up my computer and scanner and get to work. Carefully I remove the photos from the frames and scan each one. After putting them back in the frames, I thank Mr. Sandhu. Stepping outside, I try to imagine the scene in the parking lot the evening of September 4, 1962. The crowd turns it’s eyes upward as Elvis emerges from room 219. Surrounded by a half dozen guys in black jump suits, he descends the steps and merges with the crowd. The image fades. I climb into my car and continue south on the freeway. Another item on my Elvis “bucket list” has been checked off. Sources: “Elvis Popular Guest At Kalama” by Arnold Marks, Oregon Journal, Sept. 5, 1962, and “Heartbreak Motel: Elvis slept here—or was it in the next room?” by Robert Doggett, Seattle Weekly, Feb. 1, 1985. "If you never saw Elvis in person, this could be the next best thing. You’ll always be able to say, 'Elvis slept there, and so did I.'"